If you are interested in a stainless steel electric kettle that has an impressive look, then the Hamilton Beach 40885 Stainless Steel Electric Kettle should definitely be your first consideration. 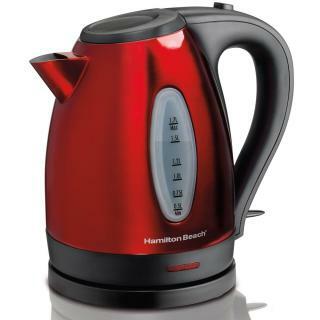 This 10 cup Hamilton Beach kettle is clearly one of the best in the market today for its price based on reviews from users and authority review sites. The kettle also has a unique candy red exterior and a cordless base for effortless serving. The kettle comes with a concealed heating element that is located at the bottom. The bottom can be detached easily for cleaning and serving purposes. The concealed heating element supplies you with a 360-degree rotating capability which allows for safer use and serving. It has an auto shut off feature that stops the kettle from over boiling your liquids. After the auto shut off has taken place, the kettle keeps your water hot for about 5 minutes. The kettle has a removable mesh filter that catches any debris and deposits ensuring that your water is safe and healthy for use. The easy push button lid makes it easy to maintain and refill the electric kettle. The spout is also well designed to prevent excessive leakage and spillage. The kettle comes with a handle that has been designed at an ergonomic angle which makes it easy to pour with finger grips to make handling safer. The water window is easily legible allowing you to control your water level as well as observe the progress of your water as it boils. For its price, this is a great budget electric kettle that can suit a wide array of budget restrictions. At 1500 watts, the Hamilton beach electric kettle has the ability to heat water quickly. Users enjoy cord-free serving which implies that the kettle can also be used effortlessly at the table without clashing with other elements. The candy apple exterior can also help to brighten up a dull kitchen. This Hamilton Beach kettle does not have additional safety features. The inside of the spout is lined with plastic. The opening is rather small can make the pouring process irregular and messy. The lid must be removed for the kettle to be filled. Since the opening of the kettle is also small to accommodate a hand, the cleaning process can also be difficult. Does this kettle worth to be bought? The Hamilton beach electric kettle is well constructed and is very compact, which means that it can be stored easily on a counter without making space appear cramped. It has a large but favorable dimension of 9.2 inches by 6.2 inches which also means that it can be transported anywhere from the dorm room to an office without being too bulky. The capacity is sufficient enough for a small family as it can hold up to 7 and a half cups of water. The side of the container has see-through windows that indicate the exact water level so that you can know exactly when to refill the Hamilton Beach kettle. Thanks to the user-friendly features of the Hamilton Beach electric kettle, this kettle is very well reviewed by consumers and bloggers. It is also well liked for its consistent performance and budget-friendly price. The heating process is fast as water can be heated up easily in as quickly as a minute, which is ideal for individuals with busy schedules. Additionally, when boiling water for your tea or coffee, the water only comes into contact with the stainless steel exterior since there is no plastic lining inside other than on the spout. Overall, the exterior is easy to maintain and can serve you for years as long as it is used and cleaned. Although the exterior of the kettle does get a bit hot, it does not get overly hot that it makes it difficult to handle the kettle. As such, you can haul the kettle from place to place without worrying that you will leave blemishes or marks on your table. In conclusion, the Hamilton Beach Electric kettle is one of the most affordable kettles in the market today and it will give you value for your money. Have you used this product before? Let us know about it in the comments below! And don’t forget to browse our blog for more tips on choosing the best kettle!